What is Long Term Debt (LTD)? Long Term Debt (LTD) is any amount of outstanding debt a company holds that has a maturity of 12 months or longer. It is classified as a non-current liability on the company’s balance sheetBalance SheetThe balance sheet is one of the three fundamental financial statements. These statements are key to both financial modeling and accounting. The balance sheet displays the company’s total assets, and how these assets are financed, through either debt or equity. Assets = Liabilities + Equity. The time to maturity for LTD can range anywhere from 12 months to 30+ years and the types of debt can include bondsTrading & InvestingCFI's trading & investing guides are designed as self-study resources to learn to trade at your own pace. Browse hundreds of articles on trading, investing and important topics for financial analysts to know. Learn about assets classes, bond pricing, risk and return, stocks and stock markets, ETFs, momentum, technical, mortgages, bank loans, debenturesDebentureA Debenture is an unsecured debt or bonds that repay a specified amount of money plus interest to the bondholders at maturity. A debenture is a long-term debt instrument issued by corporations and governments to secure fresh funds or capital. Coupons or interest rates are offered as compensation to the lender., etc. This guide will discuss the significance of LTD for financial analystsFMVA™ CertificationThe Financial Modeling & Valueation Analyst (FMVA)™ accreditation is a global standard for financial analysts that covers finance, accounting, financial modeling, valuation, budgeting, forecasting, presentations, and strategy. .
Long Term Debt is classified as a non-current liability on the balance sheet, which simply means it is due in more than 12 months’ time. The LTD account may be consolidated into one line-item and include several different types of debt, or it may be broken out into separate items, depending on the company’s financial reporting and accounting policies. When all or a portion of the LTD becomes due within a years’ time, that value will move to the current liabilities section of the balance sheet, typically classified as current portion of the long term debtCurrent Portion of Long Term DebtThe current portion of long term debt is the portion of long-term debt due that is due within a year’s time. Long-term debt has a maturity of more than 1 year. The current portion of long-term debt differs from current debt which is debt that is to be totally repaid within one year..
Download the Long Term Debt Spreadsheet to play with your own numbers. Below is a screenshot of CFI’s example on how to model long term debt on a balance sheet. 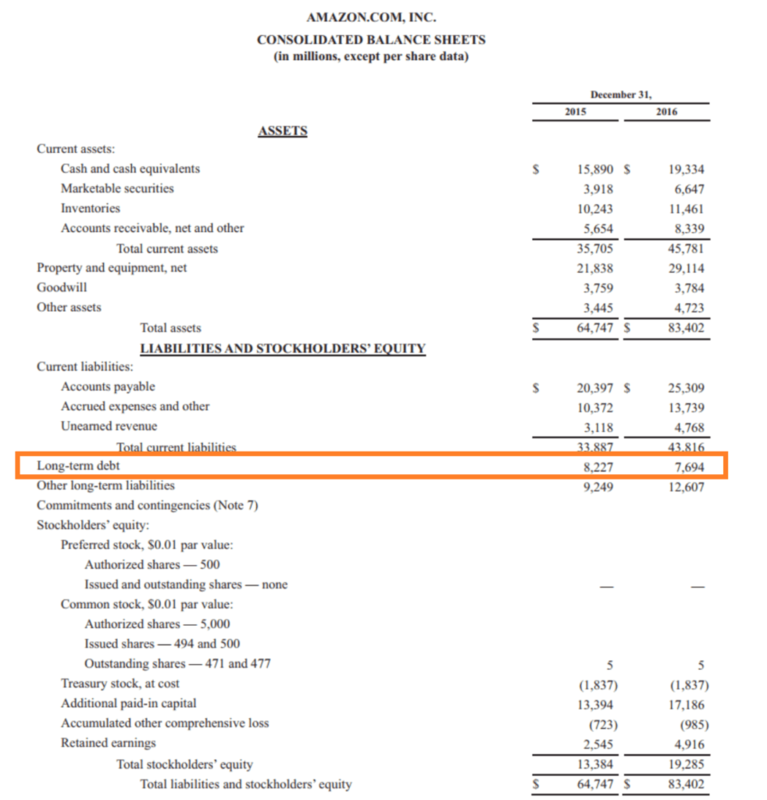 As you can see in the example below, if a company takes out a bank loan of $500,000 that equally amortizes over 5 years, you can see how the company would report the debt on its balance sheet over the 5 years. 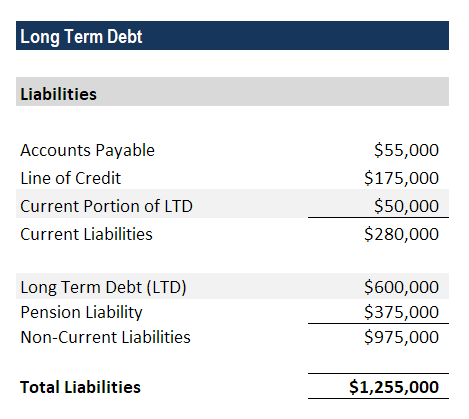 As shown above, in year 1, the company records $400,000 of the loan as long term debt under non-current liabilities and $100,000 under current portion of LTD (assuming that portion is now due in less than 1 year). In year 2, the current portion of LTDCurrent Portion of Long Term DebtThe current portion of long term debt is the portion of long-term debt due that is due within a year’s time. Long-term debt has a maturity of more than 1 year. The current portion of long-term debt differs from current debt which is debt that is to be totally repaid within one year. from year 1 is paid off and another $100,000 of long term debt moves down from non-current to current liabilities. The process repeats until year 5 when the company has only $100,000 left under the current portion of LTD. In year 6, there are no current or non-current portions of the loan remaining. Bank Debt – This is any loan issued by a bank or other financial institution and is not tradable or transferable the way bonds are. Mortgages – These are loans that are backed by a specific piece of real estate such as land and buildings. Bonds – These are publicly tradable securities issued by a corporation with a maturity of longer than a year. There are various types of bonds, such as convertible, puttable, callable, zero-coupon, investment grade, high yield (junk), etc. When companies take on any kind of debt, they are creating financial leverage, which increases both the risk and the expected return on the company’s equityEquityIn finance and accounting, equity is the value attributable to the owners of a business. The book value of equity is calculated as the difference between assets and liabilities on the company’s balance sheet, while the market value of equity is based on the current share price (if public) or a value. Owners and managers of businesses will often use leverage to finance the purchase of assets, as it is cheaper than equity and does not dilute their percentage ownership in the company. Learn more about the above leverage ratios by clicking on each of them and reading detailed descriptions. Thank you for reading this guide to understanding long term debt.